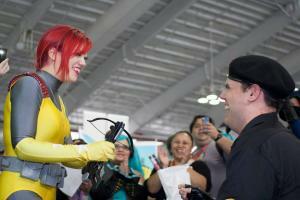 The reason the proposal happened at NYCC wasn't for The NERDIST to tape it, it was for the extra tickets. NYCC sold out fast and I wanted her dad to be there to witness it. She is very close with her father and for the first time ever in her life, he's moving out West next year, so I wanted him to witness this. I wanted to show her that he will always be with her. Originally I wanted her two sisters, Lizzie and Mel to attend as well but sadly they already had prior engagements and were gutted that they could not attend, but they sent a "Congrats!" picture seconds after the proposal happened. Life is hard and we all lose sight of those around us that love us. That day was for her, to show her that she is loved by family, friends and me.